October is Filipino American History Month for a number of reasons, but probably not because it’s my birthday month. The Filipino American National Historical Society chose October because it’s the month when the first Filipinos are said to have landed in California, at Morro Bay, Oct. 18, 1587. 16th-century Filipinos in America? Yes. So do the math. That’s 33 years before the Pilgrims, and 20 years before Jamestown. And if you doubt that, here’s some scholarship. The landing site has five stars on Yelp. Of course, after this year, October will also be remembered for another historical reason: the worst gun massacre in modern U.S. history. And now we have a five-star person of interest. 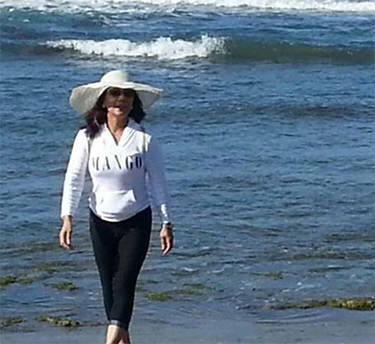 An Asian American, Marilou Danley. I saw her face and I knew instantly. From the police-provided picture to the glamour shots on her social media pages. Danley is an Asian American of Filipino descent. Technically, she was a Filipino who had an Australian passport, but she was married to an American and lived in the U.S. in Tennessee, Arkansas, and Nevada for many years. Was there any doubt? It wasn’t the surname. It was the first. Marilou? Marites, Marivic, the Mari-X prefix was a dead giveaway. But let’s be clear. She’s not guilty. She’s just the Las Vegas gunman’s girlfriend. Danley, 62, lived with Stephen Paddock, the man who stood on the 32nd floor of the Mandalay Bay hotel and opened fire on more then 20,000 country music fans gathered across the way at the Route 91 Harvest festival. Danley was far from there and somewhere in Asia. The Philippines, reported CNN. Law enforcement said Tokyo at a news conference later in the day. Danley’s not a suspect, just a person of interest. But she is probably the best lead to understanding why Paddock did what he did. That’s the puzzling thing. Why does Paddock, a retired accountant with a fondness for gambling and guns, open fire on Vegas country music fans? No one has been able to figure out a motive. Danley may help to provide clues. Does a picture visiting a niece in Dubai depict anything more than a Filipina visiting her relatives forced to find work overseas? It’s a common plight for Filipinos unable to find jobs in the Philippines. But was there some other connection? Late Tuesday, The New York Times reported the FBI is scrutinizing Paddock sending thousands of dollars to the Philippines. That’s not necessarily suspicious. Filipino families regularly send back dollars into the peso economy. But one-hundred thousand dollars coming from the perpetrator of the largest gun massacre in U.S. history is definitely worth a second look. We still haven’t heard from Danley. Could there have been domestic despair chez Paddock/Danley in the 55-plus retirement community in Mesquite, Nevada? Danley reportedly arrived in Los Angeles late Tuesday night from the Philippines and now will face tough questioning from law enforcement. Let’s hope she’s lawyered up. While we wait for officials to question Danley, the debate no one seems to want again resurfaces. I thought Sandy Hook was our last best chance for gun control. Innocent children shot to death before Christmas 2012? But that hasn’t brought any sanity to the gun debate. While the number of Americans owning guns is down to about 32 percent, the average owner has a larger than ever stockpile of eight guns, according to NBC News. NBC also reports 17 gun massacres since the 1960s. But only two (Orlando and San Bernadino) had links to any sort of international terrorism. Asian Americans already have a significant place in U.S. gun massacre history. Remember Virginia Tech? But here’s an interesting stat that came out as the debate ramps up again. 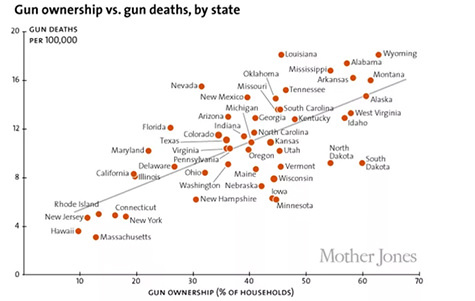 Mother Jones took gun ownership data and compared it to gun deaths by state. It’s plain to see: More guns = More gun deaths. Wyoming was the worst, with about 65 percent of households owning guns, and nearly 20 gun deaths per 100,000. Most states were somewhere around the middle. Georgia, where more than 40 percent of households own guns, had about 13 gun deaths per 100,000. Nevada has more than 30 percent of households with guns. It’s one of the highest, with nearly 16 gun deaths per 100,000. If we want to limit gun deaths, we should limit guns. Perhaps it’s a coincidence, but five of the six most Asian American states rank among the lowest in gun ownership and gun deaths. Hawaii leads the way with only 10 percent of households owning guns, and fewer than 4 gun deaths per 100,000. California, the most populous Asian American state, was also much lower than the majority of states with just 20 percent of households owning guns. It had under 10 gun deaths per 100,000. The chart is a moral guide: Fewer guns mean fewer gun deaths. We should be more like Hawaii. Moments of silence are too easy. In an attempt to reach for some higher meaning, the silence (especially in Congress) only highlights the fact that nothing is being done. A higher form of nothing is still nothing. Trump knows even his country music-loving base was stunned by this massacre. So maybe we’re ready for a real debate. It does means we’ll have to talk to one another. I have a business where I talk to people all over the country. One man recently told me he asked his congressman to put a bounty on the head of members of Antifa the antifascist protest organization. Instead of taking offense, I diffused it with a joke, because politics wasn’t part of our business discussion. In a different setting, I’d challenge him. But, of course, it would end up alienating him, and we’d both hang up in unison. Not exactly the unity we seek. Lost would be the opportunity to gain his trust, understand him, or even change his mind, let alone the opportunity to do business. So we’ve kept talking, and yesterday, we talked again. At literally the end of the day, after hours of news and revelations, we were both sad. And tired. The Second Amendment, pro-gun, pro-hunter, small government conservative had nothing to say. We pushed on with our business, working together, but we both understood one thing. Something had to be done. And that for once, what happened in Vegas shouldn’t stay in Vegas. Already, I’m seeing a similar reaction among some in the camo country crowd. People say they wonder about their blind allegiance to the NRA and to a conservative Second Amendment approach. No one is saying if we armed the concergoers, everyone would have been safer. Nevada is one state with the fewest gun restrictions and an open carry law to boot. Maybe this time, people once polarized can see the gun issue more clearly. It’s not Orlando. It’s not San Bernadino. It’s fun-loving, cowboy hat-wearing people like themselves. Men, women, children. And there they were exposed to Paddock’s automatic weaponry and the sounds of combat on the Strip. Maybe the staggering amount of carnage will finally be enough to tip the debate and make us all realize that surely, there’s no reason to continue this war amongst ourselves. More than ever, stronger gun control, especially when it comes to conversions of semi-automatic weapons, must be made a priority. AALDEF UPtype: updates date: On the afternoon of Wed.,Oct. 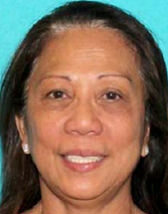 4, Marilou Danley released a statement to the media, indicating that she was not aware of Paddock’s plans to commit violence in Las Vegas. You can read Danley’s statement here.